The VX2000 racing seat is a revolutionary designed reclining seat, ideal for drivers of all sizes. 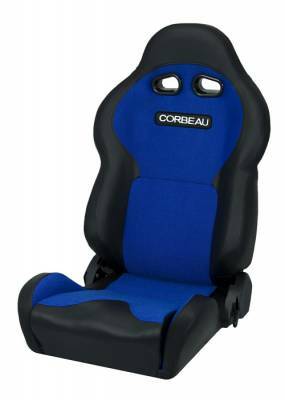 This anatomically advanced seat features an injection molded, composite shell back. This unique and stylish seat will give your interior that added luxury you are looking for. Whether on street, the track, or off-road, the VX2000 racing seat will enhance your overall driving experience. MUST be ordered in pairs (Quantity = 2) of seats. For single seat sales, please call for availability. As a rule of thumb, the VX2000 will fit up to a 42-44 inch waist while still comfortably fitting smaller drivers. The VX2000 racing seat is available in Vinyl with Cloth inserts and 100% black Leather. Please note the inflatable lumbar support and seat heaters are not an available option on this seat.